Save the date: Cider Week VA is on the books this year from November 9–18, 2018, featuring many events, including dinners, tastings and competitions all across Old Dominion. The big kick-off for Cider Week VA is the 6th Annual Richmond Cider Celebration on Saturday, November 10, from 11 a.m.–4 p.m., at the 17th Street Farmers Market. But, no matter where you are in Virginia, there’s something awesome and cider-related happening nearby that week. Keep an eye on the Cider Week VA events calendar and Facebook page for more info as November draws closer. In the meantime, get stoked by getting acquainted — or perhaps reacquainted — with some Virginia ciders that show off what the state’s cider scene is all about! Thirteen miles southwest of Charlottesville (a cider-lover’s paradise, as we’ve shared), Albemarle Ciderworks was founded in 2009 and grows over 200 different apple cultivars, both heirloom and more recent varieties, in its orchards. 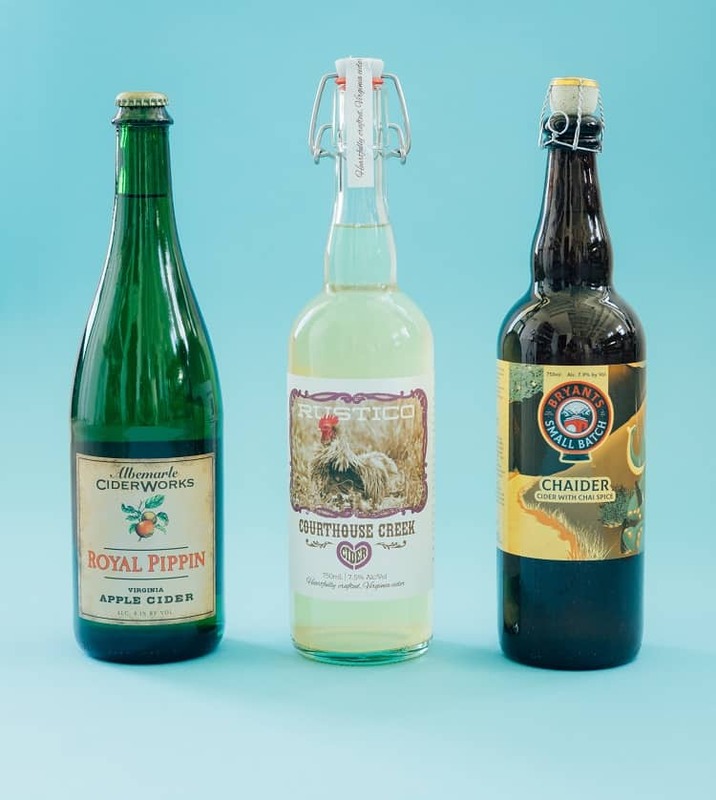 With those apples, Albemarle Ciderworks makes no-nonsense craft ciders, including Jupiter’s Legacy, Royal Pippin (a single varietal) and Ragged Mountain. Ragged Mountain is Albemarle’s most traditional cider, an 8.2% ABV off-dry blend made from Albemarle Pippin, Goldrush, Pink Lady and Virginia Gold apples, as well as some others. Its simple floral and fruity nose and short, crisp finish lends it a Champagne vibe that makes it wonderful to enjoy with food, including salads, cheese plates, pork barbecue, curried chicken salad and empanadas. Courthouse Creek Cider has two locations: a tasting room on its farm in Maidens, Va. and a newer spot in Richmond. For guests at its tasting rooms, or those lucky enough to find its ciders out in the world, a lovely variety of rustic ciders await, ranging from wine-barrel-aged still ciders to blackberry lavender to hoppy and off-dry. Rustico is the all-purpose cider that sets the standard at Courthouse Creek: a blend of finished ciders from various barrels, aged from six months to a year. The cider is bottle-conditioned, and pours with a crisp, dry character and plenty of effervescence. This cider exemplifies Courthouse Creek’s dedication to minimal intervention. Bryant’s Cider located on is a sixth-generation family farm in Roseland, Virginia. Its handcrafted ciders are fermented in small batches without the use of concentrates, preservatives, artificial flavors or any other chemicals. Clever and unpretentious names, like Unicorn Fuel (infused with rose hips and hibiscus for that rosé cider feel everyone’s gaga for these days) and Coolbanero (with cucumbers and habanero peppers) belies a fun spirit that we love. Chaider is light, refreshing cider that takes the distinctive spices found in chai tea — ginger, cinnamon and nutmeg — and marries them with the crisp, dry character of apples. Though a chai-spiced cider might sound more appropriate for a wintry night, Chaider manages to hit some really nice subtle notes and keep the spice profile in check, so it actually works in warm weather, too! What are your favorite Virginia ciders? What Cider Week VA events are you pumped for? Let us know!